This street scene, from when I was on my little adventure in Hoi An, Vietnam, just intrigued me. I found it compelling with a number of elements but I couldn’t figure out a graceful way to combine them all into one cohesive photograph. There was the wall, with the monochromatic, faded whitewash and crumbling plaster offset by the colorful collection of impromptu street restaurant equipment strewn on the sidewalk. There was again the contrast between the mix of traditional and contemporary styles in the people’s dress and a fair amount of action happening with the customers, the chef and her helper acting as sous-chef behind the bamboo baskets. 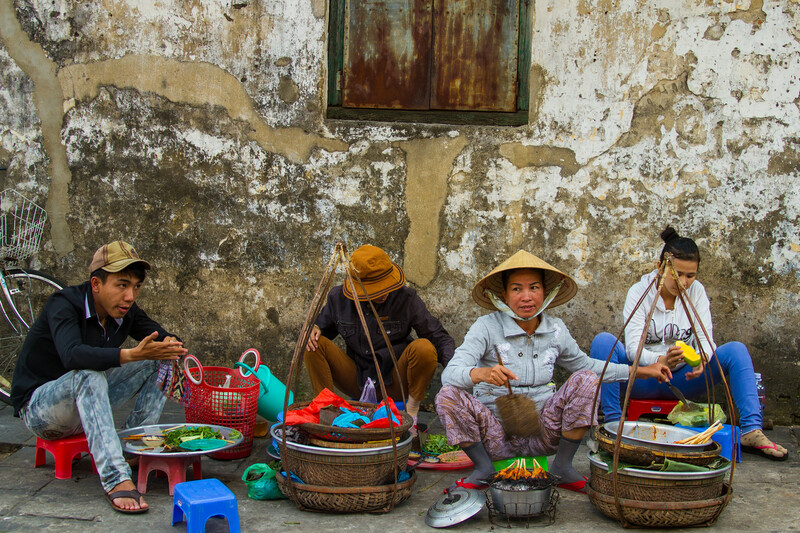 I decided to just forgo “the rules” and make the image, but this isn’t one of those photographs that says, this is a picture of a Vietnamese woman make chicken sate on the street. It requires a bit of work on the part of the viewer and a little more than a glance to decipher exactly what is going on. I like the way you can see movement in the chef’s hand as she fans the grill with one hand and handles a knife with the other. I like the fact that it is the baskets that make the chef come to the front of the scene and not the use of depth of field that would have caused detail in the wall to be lost. I try to put a lot of care into my photographs and most of the time this thought process happens automatically but for some reason, I wanted to look a little deeper into this one. Do you think it works? Image made with a Canon EOS 7D 18 MP CMOS Digital SLR Camera with a Canon EF 28-135mm f/3.5-5.6 IS USM lens. Hoi an has become a big tourist destination. Did you see much of Viet Nam? Many years ago, I spent a year in Chu Lai. On this trip I was only in Vietnam for ten days. I started in Ho Chi Minh and traveled, mostly by train, to Hanoi. Even though I was a bit time limited I decided to stay in Hoi An for two nights because I found it so compelling. It was, as you say, a bit touristy but not tacky or too crowded the way some places come to be.I am hoping to get back and spend a lot more time there before I leave Asia. Do you have specific recommendations? Maybe something great but undiscovered. If you haven’t been already Marble Mountain is nice to see and their are many ex-patriots (American VN war vets). Your photos are very interesting, Mexico and Asia. This is a long way from DTN. I have been through DaNang but didn’t get to go to Marble Mountain. The photos look great and it seems like it would be an interesting place to visit. My plan is to, sometime in the next year, go spend a month in Vietnam. I was amazed by how beautiful and interesting it is. And the food! Mexico, Asia … the next decade promises some other amazing places as well! I plan to cover all the continents. Can’t see living in Antarctica though.